Melukote or Melkote in Pandavapura taluk of Mandya district, Karnataka, is one of the sacred places in Karnataka. The place is also known as Thirunarayanapuram. It is built on rocky hills known as Yadavagiri or Yadugiri overlooking the Cauvery valley and about 51 km from Mysore and 133 km from Bangalore. Distance from Bangalore to Melukote is 149.0 km and takes around 2 h 52 min. Distance from Melukote to Shravanabelagola, Karnataka is 35.5 km and travel time is around 50 min via SH47. Early in twelfth century, the great Srivaishnava saint Sri Ramanujacharya took up his residence and lived here for about 14 years (said so). It thus became a prominent centre of the Srivaishnava sect of Brahmins, who obtained from the Hoysala king Vishnuvardhana, who had become a follower of the Acharya, an assignment of the fertile tracts of land in the neighbourhood, especially of the Ashta Gramas, on either bank of the Cauvery. In the 14th century, the place suffered at the hands of Muslim invaders, who wrecked Dwarasamudra and it was at Tondanur(Tonnur) at the southern foot of the hills, that the Hoysala king at first retired. It was subsequently restored, in about 1460, by Thimmanna Dannayaka, a chief of Nagamangala, who was an army commander of the Vijayanagar king Mallikarjuna or Immadi Prudhadeva Raya. The buildings must have been on a grand scale, as can be seen from the remains of the Gopal Raya gate on the South which are of immense proportions. The Brahmins deserted Melkote which was then plundered. The principal temple is a square building of large dimensions but very plain, dedicated to Lord Cheluva-Narayana Swamy or Tirunarayana. The utsavamurthi, which is a metallic image, representing the deity which is called Cheluvapille Raya or Cheluvanarayana Swamy whose original name appears to have been Ramapriya. According to a legend, this metallic image was lost and was recovered by Sri Ramanujacharya. The annual report of the Mysore Archeaelogical Department states on the strength of epigraphic evidence, that the presiding deity of this temple was alerady a well known object of worship before Sri Ramanujacharya worshipped at the shrine in December 1098 CE. and even before he came to the Mysore region and that very probably he used his influence to rebuild or renovate the temple. From the lithic records of the period, existence of Tamil influence and Vaishnava worship in the area are also evident. The temple is richly endowed having been under the special patronage of the Mysore Rajas, and has a most valuable collection of jewels. As early as 1614, the Mysore king Raja Wodeyar 1578 - 1617 who first acquired Srirangapatna and adopted the Srivaishnava faith, handed over to the temple and the Brahmins at Melkote, the estate granted to him by Vijaynagar king Venkatapati Raya. On one of the pillars of navaranga of the Narayanaswami temple is a bas relief about one and a half feet high, of Raja Wodeyar, standing with folded hands, with the name inscribed on the base. He was said to be a great devotee of the presiding deity and a constant visitor to the temple. A gold crown set with precious jewels was presented by him to the temple. This crown is known as the Raja-mudi after his name. A legend says that on the day of his death, he was observed entering the sanctum and was seen no more afterwards. From the inscriptions on some of the gold jewels and on gold and silver vessels in the temple it is learnt that they were presents from Krishnaraja Wodeyar III and his queens. Krishnaraja Wodeyar III also presented to the temple a crown set with precious jewels. It is known after him as Krishnaraja-mudi. Vairamudi or Vajramukuta, another crown of great value, seems to be older than Raja-mudi and Krishnaraja-mudi and it is not known as to who gave it to the temple. All the three crowns are kept in the safe custody of the Government and brought to the temple on specific annual occasion for adoring the image of Cheluvanarayana Swamy. The vairamudi festival, which is the chief annual celebration is attended by more than 400,000 people. In 1785, Tipu Sultan gave some elephants to the temple. The puja timings for CheluvanarayanaSwamy temple are, 8.30am to 12.30pm, 4.00pm to 6.00pm and 7.00pm to 8.30pm. During Saturdays and Sundays, the morning puja timings will be from 8.30am to 1.30pm. Inside the Cheluvanarayanaswamy temple the pillars are carved beautifully. 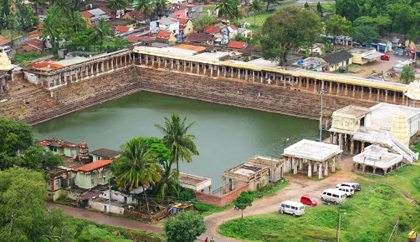 Before visiting Sri CheluvanarayanaSwamy temple you can visit the Panch aKalyani pond. The pond is very big with mantaps, Bhuvaneshwarimantap is located here. Kalyani Pond, the chief of several sacred ponds in Melukote, by sprinkling some of its water on our heads. According to the Isvara-samhita, when Lord Krsna in His incarnation as Lord Varaha lifted the earth from the universal ocean, some drops of water clinging to His body fell on the hill at Melukote, creating Kalyani Pond. The Padma Purana mentions Kalyani Pond, and according to the MatsyaPurana, Garuda, Lord Visnu's eagle-carrier, brought white clay here from Svetadvipa, Lord Visnu's planet within this universe. Two tanks separated just by a fleet of steps. One tank is salty and the other tank is sweet. That is the surprising element here. There is a shrine for Kulashekara Alwar. The steps of the pond are symmetrically built and it is a treat to watch. The pond is filled with fishes and small turtles were basking in the sun. 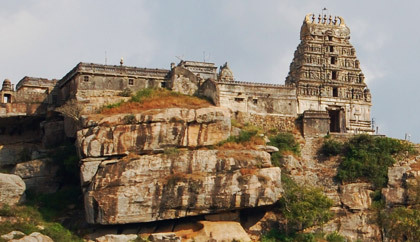 On the top of the hill is an impressive temple of Yoga Narasimha. Krishnaraja Wodeyar III presented a gold crown to this temple. Situated under the Pandavpura Taluk in the Mandya district of Karnataka, the impressive temple stands on top of a hill at a height of 1777 metres above the sea level. The majestic temple is dedicated to the Hindu deity, Narasimha. The temple houses an idol of Narasimha in a seated position with the Yogapatta. The temple is considered to be one of the seven holy centres devoted to the worship of Narasimha. Apart from the regular pujas carried out on a daily basis, the temple holds special pujas to celebrate the Narasimha Jayanthi festival every year. The temple has a huge drum that was donated by Tipu Sultan. It has a beautiful bell that was donated by the Mysore Parakalamatha. During the rule of the erstwhile Wodeyar Kings of Mysore, Krishnaraja Wodeyar III had donated a gold crown to the temple deity. The temple has extended timings of darshan during the weekends and public holidays. On every Saturday, Sunday and public holiday darshan is allowed from 11.00 am to 2.00 pm during the morning hours and from 5.00 pm to 8.00 pm during the evenings. The temple strictly prohibits any kind of photographing inside the temple premises. But visitors can keep their cameras with them while they are inside the temple. To reach the place the main transportation is by bus from Mandya, Srirangapatna, Nagamangala and some other places of the state. There are taxi services available from Bangalore and Mysore to reach the place. Melkote is also the location of the Melkote Temple Wildlife Sanctuary. This Sanctuary was created on 17th June 1974 mainly to protect the wolf. Other mammals found in this sanctuary are jungle cat, leopard, bonnet macaque, langur and pangolin. It is also an ornithologist's paradise, with numerous species of birds indigenous to the area.and also if walk in the early morning you will see peccock. Raya gopura (Gopalaraya entrance) is an incomplete structure leading to the Melukote hill. 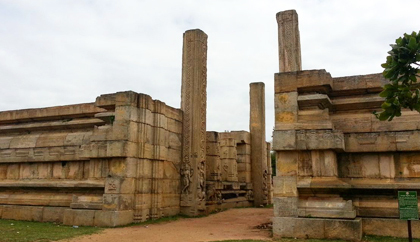 It has four tall pillars and looks similar to Mamallapuram Rayar Gopuram. Popular Rajini movie Padayappa is said to be shot here. "Gopura" or "Gopuram" means "The Entrance A Temple" especially in Southern India. This temple entrance was built by Hoysala king Vishnuvardhana, near the main temple of Melukote. It is said to have been built overnight (citation required). When Ramanuja came to Melukote from Sri Rangam he came in the disguise wearing the white clothes instead of the saffron cloths of sanyasi. The reason is he left Sri Rangam because the Shaivaite king wants to kill him for spreading Vaishnavism. It is said that at this place Lord Dattatreya came and again awarded him the saffron cloths. There is small temple to mark this side. It is inside the jungle you have to walk past the two sisters' kund on the forest trail and on your left side is this place. You continue walking on the road you will come to the end of the mountain and there turn around the mountain you will find this place. It is said that here Lord Rama shot an arrow to make Ganga appear. There is small cave from where water comes out and also there is small temple having deities of Rama, Lakshaman and Sita. According to the NaradiyaPurana, Prahlada Maharaja installed the deity of Yoga Narasimha thousands of years ago while visiting Visnuchitta, a celibate performing penance here. One can still see the cave under the temple where it's said that Prahlada Maharaja meditated. To Visit the cave down gofrom the northern, back side of the temple. The entrance has narrow steps, and then one has to bend head and even crawl. The point where Prahlada Maharaja meditated is just below the deity. Crawled some more one then cancame out under the lower part of the temple. From the roof of the temple, one can see Melukote spread out below. The most prominent places to see are the TiruNarayana temple, Kalyani ("Auspicious") Pond, the large entrance gate of a time-ravaged fort (Melukote means "upper fort"), and the Academy of Sanskrit Research.All the surrounding area is clearly visible from the hill. At night one can see the lights of Mysore City. The pooja timings at Yoganarasimha temple are, 9.00 to 10.00am (Nithyakatle). Abhisheka will be done from 10.00 to 11.00am and darshan will be from 11.00am to 1.00pm. Evening darshan is from 5.30pm to 8.00pm. During Saturdays, Sundays and public holidays, the darshan will be from 11.00am to 2.00pm and 5.00pm to 8.00pm. Thonnur Lake is a picturesque excursion site, located about 30 kilometres away from Mysore. It was once referred to as Moti Talab by the mighty ruler of Mysore, Tipu Sultan. This was because its water was so clear that every pebble in the lake could be seen from above. The lake is spread across 2000 acres and is used as a tank to collect rainwater for irrigation. Surprisingly, it never runs out of water even if there is no rainfall. It is on the road to Pandavpura. About 10km from the junction is the thonnur lake. The lake and its surroundings make it a scenic spot. It is among those places that are not known to many tourists; however, locals are often seen here picnicking with their friends and family. Just 500mtrs down the Thonnur lake is the Nambhi Narayana Temple.